Oxford Middle school students collaborating and problem solving. Hypotheses. Data collection. Research. Blue Valley science teachers like Michael Richards are continually seeking new ways to challenge and engage their students, and such was the case at OMS when Richards applied for and received a BVEF grant for an aquaponics system! So what is aquaponics? Aquaponics recirculates water from a fish tank through a vegetable grow bed. Nutrients from the fish waste feed the plants, and the plants filter the water to keep the fish healthy. The two main components of the system are the fish tank and the grow beds with a small pump moving water between the two. The water passes through the roots of the plants before draining back into the fish tank. The plants extract the water and nutrients (fish waste) they need to grow, cleaning the water for the fish. Q. This sounds very exciting and fairly complex! What were you hoping to accomplish with a grant for an aquaponics system? 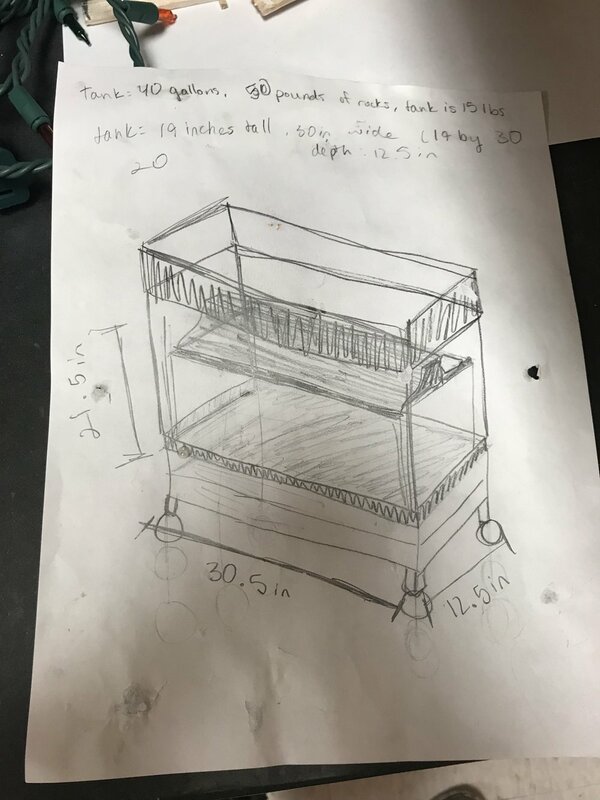 A. I wanted the kids in my guided study class to plan, design, and build an aquaponics system all while working on intangible skills like collaborating and problem solving. Besides creating the actual system, they had to figure out how to house the 500-pound fish tank. The students drew up a rough draft, built a model out of balsa wood, and then constructed the actual end product. The students worked so well as a team and did a great job of assigning different tasks to be as efficient as possible! Furthermore, I wanted to have this system in my room to create more engagement/excitement for science and to use it as a model for multiple topics we cover in the 7th grade science curriculum. Q. What were the most significant achievements of your program? A. It was great to see how well the kids worked together and problem solved. For example, they had to figure out how they were going to make this structure so it could hold a 500-pound fish tank. And then, they had to work out how we were going to get the tank up onto the shelf! Q. What kind of impact did you see on student learning? A. The students shared that it was fun solving the many issues that came up as we began to build. They realized that they have to put more effort and thought into the designing process. The aquaponics system creates a natural engagement and enhances science learning. It is visually engaging and generates so many questions! You can talk about relationships, biotic and abiotic factors, photosynthesis, nutrients, nitrogen cycle, and so much more! In addition, the aquaponics system is self-sustaining and will be around for a long time. We will continue to plant new plants as the old ones die and maintain the aquarium and fish in it. Overall, it was a great experience for them! Q. What would you say to other science teachers who may be interested in applying for this type of BVEF grant? A. The grant program is excellent! The kids loved when the BVEF Surprise Squad came into my classroom to deliver the good news. This project was a great opportunity for learning and I think every science classroom/school should have one of these systems. The natural engagement they create is amazing, and because of this, I was able to spark a conversation about the science behind the system! Thank you to BVEF for funding our aquaponics system at Oxford Middle. I am 100% positive this is something the kids will always remember.